The following happens to me using Firefox 5.0 on OS X 10.6.7, but also on Firefox 4.0.3 (with all plugins disabled and emptied cache, restarted etc). It doesn't happen with Safari 5.0.5, though. On the meta site, we still have the desired result. 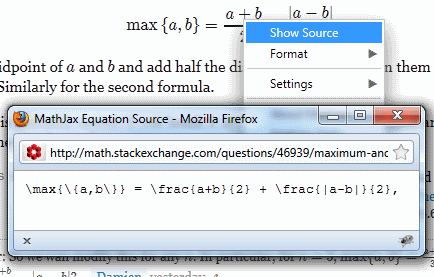 Could this please be re-installed on the main site, because this feature is very useful for referring LaTeX-unsavvy users to, while the new result is of no use, really. Not the answer you're looking for? Browse other questions tagged support bug status-norepro .